Sub: - Fee Collection through UBI Web Portal System for fourth Quarter of 2017-18 -Reg. 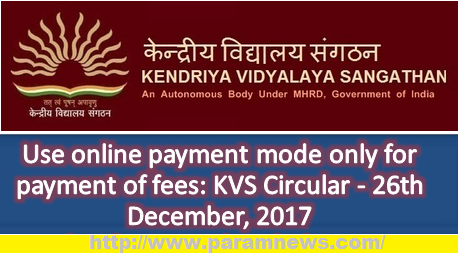 You are aware that Kendriya Vidyalaya Sangathan has been collecting fee through UBI Fee Collection Web Portal System. For collection of fees through the system, student data verification is a mandatory process on the part of class teachers and Principals. It is observed from the data available on Fee Portal that tlll date, student data verification process has been completed only in respect of 88 percent of total students strength. It is intimated that Student Data verification for 4th quarter (Jan, 2018 to March, 2018) of 2017-18 has to be completed by 29th December, 2017 up to 6.00.P.M without fail. On 29th December, 2017 at 6.00 PM, the UBI Official will freeze the Fee Portal to complete the process/activities for starting the fee collection of fourth quarter of 2017-18. It may be noted that once the Portal is frozen, verification of student data will not be possible and fee will not be collected through the system. 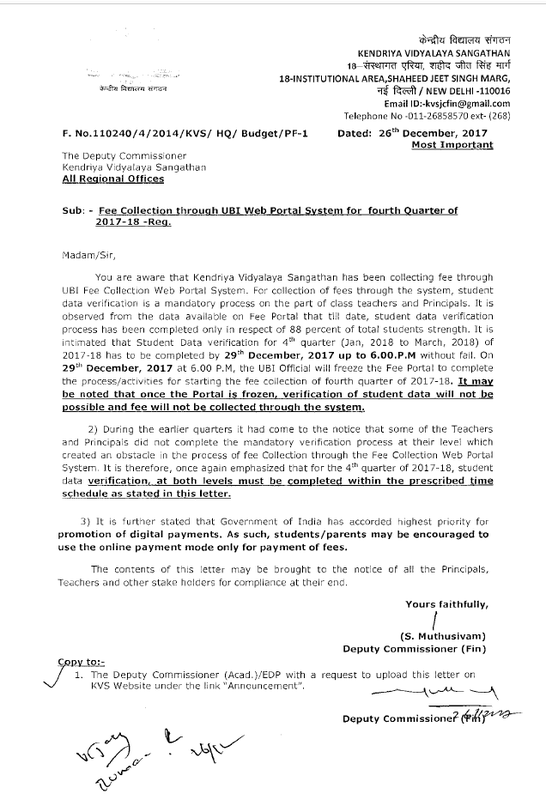 2) During the earlier quarters lt had come to the notice that some of the Teachers and Principals did not complete the mandatory verification process at their level which created an obstacle in the process of fee Collection through the Fee Collection Web Portal System It is therefore, once again emphasized that for the 4th quarter of 2017-18, student data verification, at both levels must be completed within the prescribed time schedule as stated in this letter. 3) It is further stated that Government of India has accorded highest priority for promotion of digital payments. As such, students/parents may be encouraged to use the online payment mode only for payment of fees. The contents of this letter may be brought to the notice of all the Principals, Teachers and other stake holders for compliance at their end.